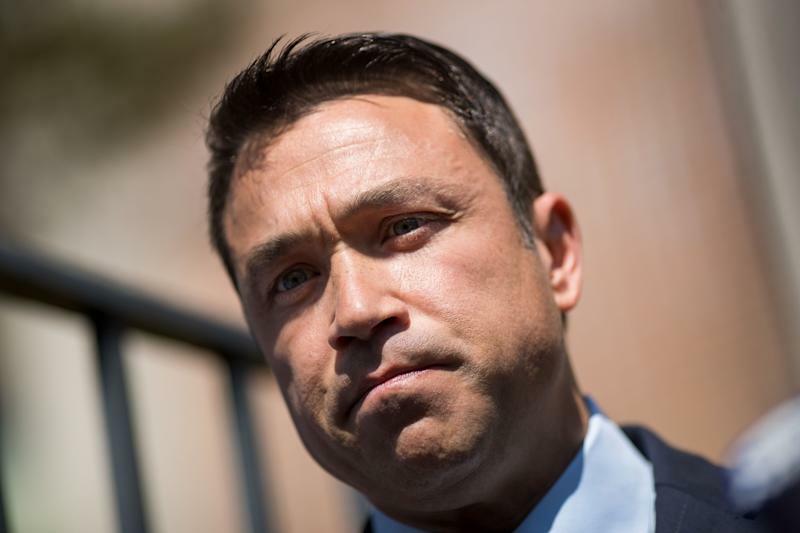 Michael Grimm (above) could not oust Dan Donovan, the congressman who replaced him in 2015. Rep. Dan Donovan warded off a competitive primary challenge from former Rep. Michael Grimm to win the Republican nomination in New York’s 11th Congressional District on Tuesday. Many Republican strategists had worried that a victory for Grimm would spoil the party’s chances of retaining the seat. Grimm had left the House in early 2015 after pleading guilty to tax evasion and subsequently served seven months in prison for the offense. Donovan won the special election that year for the 11th District seat. The 11th District, which encompasses all of Staten Island and parts of southwestern Brooklyn, will be among the most hotly contested seats this fall as Democrats try to gain control of the House of Representatives for the first time since losing it in the tea party wave of 2010. The Democratic Congressional Campaign Committee, the party’s main House election arm, put the 11th District in the initial list of seats it hoped to flip. The National Republican Campaign Committee, for its part, added Donovan to its “Primary Patriots” list of vulnerable incumbents. Donovan will now face off against Max Rose, an Army veteran who cruised to victory in Tuesday’s Democratic primary. Rose has amassed an impressive war chest, outraising Donovan and Grimm by substantial margins during the first quarter of this year. Donovan’s win will likely prompt sighs of relief from Republican operatives who worried about how Grimm’s checkered past would have impacted the party’s chances in November. In addition to his felony conviction, Grimm gained national attention in 2014 when he threatened NY1 reporter Michael Scotto after being asked about an investigation into his campaign finances. With the camera rolling, Grimm threatened to “break [Scotto] in half” and throw him over the balcony in the House office building where they stood. As with so many races this election cycle, President Donald Trump played an outsized role in the 11th District. The president backed Donovan’s campaign, keeping with his current habit of endorsing incumbents, and his allied super PAC, America First Action, spent resources on behalf of Donovan. However, some Trump allies rallied around Grimm, including longtime Trump booster Anthony Scaramucci and former White House adviser Steve Bannon ― although Grimm’s campaign distanced itself from Bannon after his very public falling out with Trump. Much of the division within Trump’s orbit was likely attributable to Donovan’s voting record in the House, which Grimm and his allies have pointed out is not as lockstep with Trump as some supporters of the president would like. Donovan’s supporters, meanwhile, focused much of their attention on Grimm’s criminal record and what they regarded as his unelectability in November.